Shielded DataMax Cat6 Cable - Stranded, FTP, White PVC - 1000 FT is ideal for voice, data, video and security communications medium for your network installation where EMI/RFI interference may be a concern. Wiring your home, home office, office or even a entire college campus, we have the right cable for you. 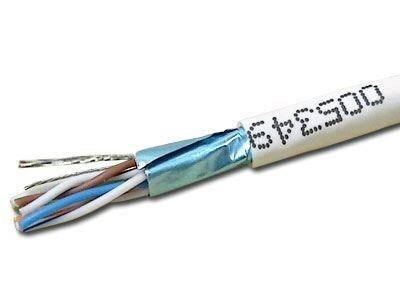 Our bulk 250Mhz shielded CAT6 cable is available in a wide selection of colors to help assist with network organizing and identification. ROHS compliant and UL Listed. DataMax 6, 4 pair, Shielded F/UTP (foil tape) flexible patch/jumper cable. Supports shielded TIA Category 6 networks and ISO 11801, EN 50173 Class E screened applications. Terminates to high-performance shielded modular plugs. Tested to 250 MHz. RoHS compliant.